Most nuclear reactors these days are light water reactors. Light water is essentially just very very pure regular water1, and light water reactors use it as both a coolant and a neutron moderator. 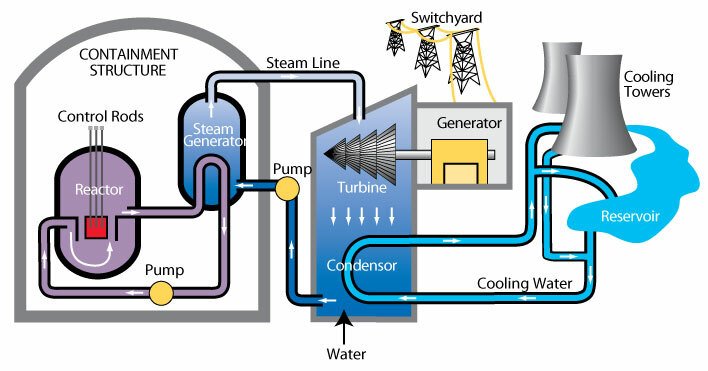 There are two main types of light water reactor: the boiling water reactor design, where the coolant water is directly boiled off the fuel rods to create steam to drive the power plant, and the pressurised water reactor (PWR), which compartmentalises its reactor and coolant into a primary thermal loop separate from the main workings of the reactor. PWRs do not boil their coolant water; it is pressurised to keep it hot, liquid and flowing around the loop. Part of the loop passes through a secondary coolant loop containing water, and as it does so the water inside the primary loop dumps its heat into the secondary loop. This both cools the water in the primary loop, allowing it to be circulated back around to remove heat from the fuel rods again, and boils the water in the secondary loop into steam to drive the power plant turbine etc. etc. Part of the attraction of the light water reactor design is that it has a negative void/temperature2 coefficient. You’ll recall that Chernobyl had a positive void coefficient – the coolant water got hot, which caused it to boil into steam, which increased the reactivity of the fuel rods, which raised the temperature of the reactor, which caused more coolant water to get hot and so on. A positive temperature coefficient means that an increase in temperature in the reactor will lead to a positive feedback loop which causes further increases in temperature in the reactor. A negative temperature coefficient is exactly the opposite; any increase in the temperature of the cooling/moderating water will lead to a decrease in the reactivity of the fuel rods, which decreases the temperature of the reactor and allows it to self-stabilise. How do light water reactors manage this feat of thermodynamic ingenuity? Quite simply, as it turns out. Light water moderates neutrons by bouncing them off of its hydrogen atoms. This robs them of speed/energy and slows them down to the point where they can induce a fission reaction in u-235. A greater density of hydrogen atoms means a greater likelihood that a neutron will hit one and be slowed; conversely a lower density of hydrogen atoms means that fewer slow neutrons will make it through to the fuel rods. When you heat water it expands; heat it too much and it’ll get to the point where it vaporises into steam, but the water in light water reactors never gets this far because the reduced density of the hydrogen atoms as the water expands means less slow neutrons are created, which decreases the reactivity of the reactor, which allows the moderating water to cool down again. 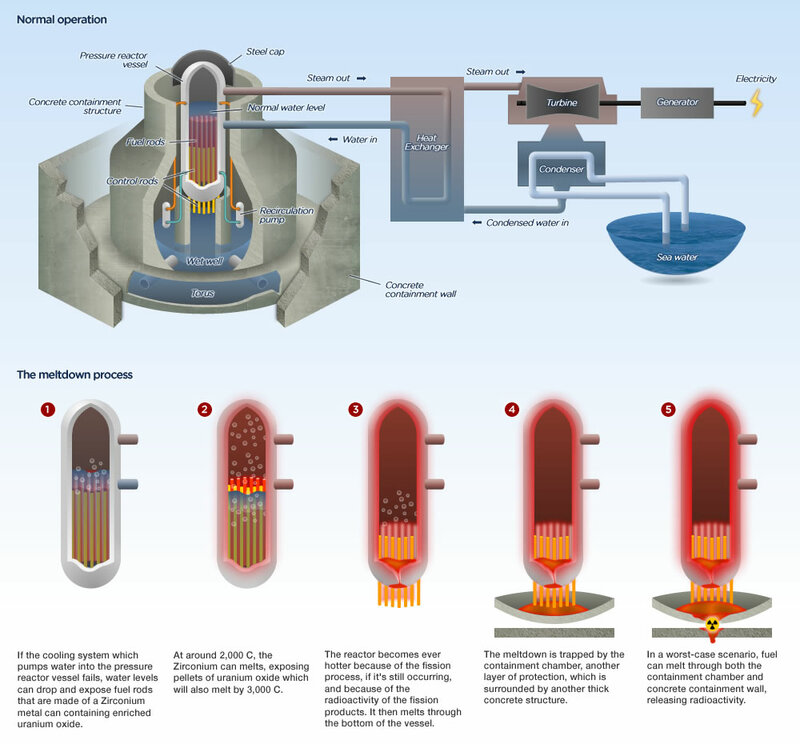 This provides a powerful passive safety factor that allows the reaction to self-control around a certain temperature range dictated by the position of the control rods, and it’s probably the primary reason why light water reactors are considered to be inherently safer than first-generation nuclear power planet designs. However, they are not infallible. Three Mile Island, the SL-1 incident (I did not know about this prior to writing this post, which just goes to show you how much I get out of doing it), and Fukushima were all light water reactors, and they all eventually suffered from catastrophic power excursions/fuel rod meltdowns. All three of these reactors were SCRAMed (shut down) at the time of the accidents, which removed the passive safety factor provided by the primary coolant system; since the reactor is already “Off” and the reactor is operating with minimal levels of reactivity, a decrease in reactivity caused by expanding water volume isn’t going to do much. SL-1 was an experimental reactor with a design that was, if not quite unstable, then definitely very dangerous: withdrawal of a single control rod from the reactor’s shutdown state caused the reactor to go prompt critical, releasing its energy in a power excursion/steam explosion that killed the three operators3. It’s not really an example that’s relevant today except to say that SL-1 is the reason why modern reactor designs make it impossible for the removal of a single control rod to cause criticality. Three Mile Island and Fukushima are slightly more relevant. At Three Mile Island a valve stuck open and vented some coolant away from the shutdown reactor core; this produced readings in the control room that were misinterpreted by the plant operators who then vented more coolant to “fix” the problem. When reactors are shut down the fuel rods inside them are still very hot due to the continuing decay of leftover fission fragments from the nuclear reaction, and they require active cooling from a backup power supply. In the case of Three Mile Island the reactor lost too much coolant and the temperature of the fuel rods increased to the point where approximately half of the nuclear material inside the reactor melted down. Fukushima was basically the same thing, except instead of “operator ineptitude” you can substitute “once in a century tsunami which flooded the backup diesel generators and took out the cooling system”. How do we prevent fuel rod meltdown? The short answer is “For the love of God don’t let the cooling system fail”. If there is no way to remove excess thermal energy from the rods then they will melt down sooner or later; fuel rods are clad in a sheathe of corrosion-resistant material (commonly zircaloy4) that also prevents fission fragments escaping into the coolant and making it radioactive, but which will do nothing to prevent a meltdown. Meltdowns are potentially very hazardous because it raises the possibility of the molten core melting through the bottom of the reactor vessel, through the ground and into the groundwater supply. To say this would have catastrophic consequences for the surrounding area would be a slight understatement, which is why anti-meltdown measures in nuclear reactors are all focused around containing the molten nuclear fuel should a meltdown occur. These include making the reactor vessel an enormous steel can which is designed to withstand jumbo jets being flown into it, as well as placing an enormous concrete catcher’s mitt just beneath it in order to prevent any nuclear material escaping from the reactor building. Loss of coolant accidents are probably the primary safety vulnerability of nuclear reactors today. The good news – if you can call it good news – is that the light water reactor is a second generation design dating from the 1960s. Reactors being built today are generation III, which are essentially improved generation II designs that have longer lifespans and increased fuel efficiency. 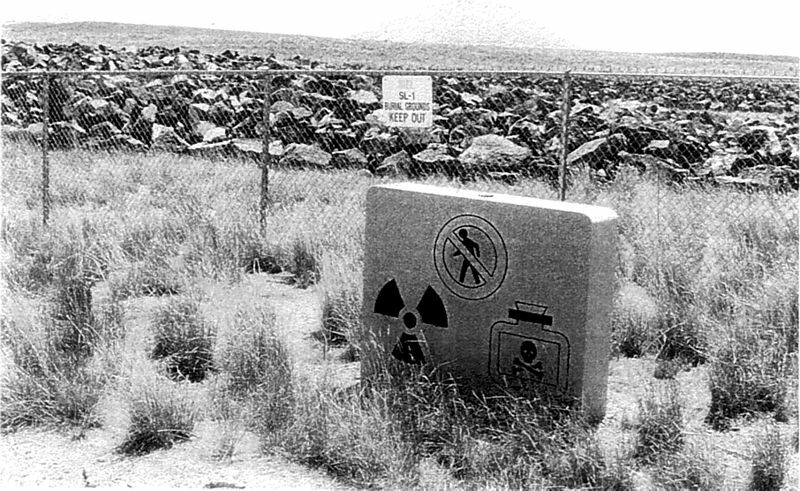 Generation IV reactors are another kettle of uranium altogether, however; they’re theoretical designs which incorporate radical changes meant to both reduce the number of harmful radioactive byproducts produced by the fission process as well as making catastrophic events like meltdowns all but impossible. They’ll have to undergo a decade or two of R&D before they can even be deployed, but generation IV reactors are where the future of nuclear power lies, and I’ll be going into detail on them next time. Other resources: UC Berkley guy wants you to learn all about nuclear power. There is also this MIT lecture series if you happen to have ten hours to spare. Why does it have to be pure? Normal water that you get out of your tap is riddled with impurities that would absorb more neutrons than would otherwise be desirable, so light water is used to keep the reactor running as efficiently as possible. In general a good moderator is more or less free of any neutron poisons, so the graphite moderator rods at Chernobyl had similarly been purged of boron. This is why we dump boric acid into reactor cores when things are going horribly horribly wrong – as several suicidal helicopter pilots did at Chernobyl – and it’s also one of the reasons why the German nuclear program never got off the ground during the Second World War. The German scientists found graphite didn’t work as a moderator but never figured out that it was because it was full of boron that was absorbing all their neutrons, and this forced them to attempt to use heavy water as a moderator. And then of course the SOE sent in Norwegian commandos to destroy the plant that produced Germany’s heavy water, and that was that. Void coefficient, temperature coefficient and reactivity coefficient are all used interchangeably by both Wikipedia and my textbooks, which makes sense because they’re all pretty much the same thing. Wikipedia has this to say on the incident: “One of the shield plugs on top of the reactor vessel impaled the third man through his groin and exited his shoulder, pinning him to the ceiling.” All I can say to that is OW, although it was probably quicker than the other two victims who were basically melted by the steam explosion. Somewhat hilariously a zircaloy cladding makes loss-of-coolant accidents more hazardous because it undergoes a rather energetic oxidisation reaction when exposed to steam, similar to this. The subsequent explosions were responsible for a majority of the damage to the Three Mile Island andFukushima plants. I read about the SL-1 incident and was going to mention the guy getting pinned to the roof but when I got to the bottom I saw you had mentioned that in your 3rd reference. I second your ‘OW’. I like the video you link to in the 4th reference at the bottom. The flame looks like something out of Studio Gibli film and is trying to escape from the dish. Awesome text. Working for company building nuclear power plants of the 3rd generation it was a good read.